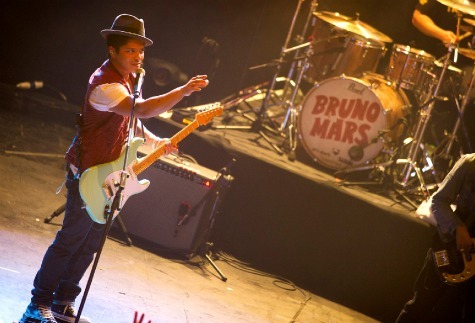 I was lucky enough to get hold of a pair of tickets for the Bruno Mars mini-tour. The venue was the HMV Institute in Birmingham, and if, like me, you've never heard of this venue then I strongly recommend that you check it out — it really is worth a visit. The HMV Institute, formerly The Barfly Club, maybe a small venue (1500 capacity) but for me it was an ideal way to see one of the most successful pop stars of the last twelve-months. Dressed in his trade-mark hat, Mars waltzed onto stage to screams of delight from a small but jam-packed audience and delivered a flawless, pitch-perfect vocal performance. It was a fascinating gig and a great way to showcase his laid back, rhythmic, big band sound. Playing a barrage of hits from his world-wide smash hit debut album -"Doo-Wops & Hooligans" - he teased the audience, with his slick and stylish movements, as he sang his way through songs like: Runaway Baby, Marry You, Count On Me, The Lazy Song, Our First Time, Talking To The Moon, The Otherside, and a brilliant version of Michael Jackson's, Billie Jean. He also sang Billionaire — the Travie McCoy song on which he featured — and it went down a storm as the crowd sang along. Also on stage was special guest, rapper, B.o.B and together they electrified the audience with their hit song Nothing On You. But the highlights were, without doubt, his two number one hits, Grenade and Just The Way You Are which sent the crowd into hysterical overdrive. It was nice to see how much time he took interacting with the audiance, and he also annouced that, earlier that day, his record company had told him that his album "Doo-Wops & Hooligans" had gone platinum, and deservedly so. And after such a superb performance, it was hard to believe that just a couple of years ago this young man was earning a living jamming at local bars for tips. 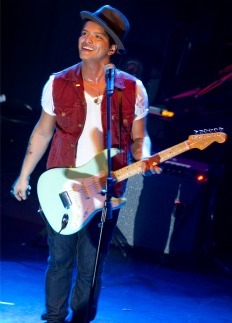 But I'm sure that this is just the start of a massive carrer for Bruno Mars. Other Blog Posts you may be interested in. William Shatner, The Pendragons and what went wrong? Please remember to share this article with your friends. It's easy to do just use the floating toolbar to the left.